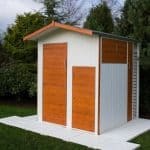 This is one of the larger sheds that Treetops Traditional offer in their line of security themed sheds and right from the get go, we knew we were going to like it. You can see from the pictures, just how secure this looks, but Treetops Traditional have made it look secure, without having to design it as if it were some kind of prison that holds rakes, hoes and other gardening items. The depth is a huge 10 feet in size, but with the width being 6 feet it actually is not just for large gardens. The height of the shed is equally as impressive as the floor space. The highest point of the shed is right around 6 feet 7 and the lowest is 5 feet 9 this is quite generous amount of headroom so you will not have to be hunched over or even on your knees when you are in here. The pent roof is really nice in its looks and its design. This pent roof is angled so that the rain will always run off, best of all it is not running off where the door is so it is not going to drip onto your head. The 12 mm tongue and groove boards are protected by felt to really give the things you place in here the ultimate protection from the rain. We love the wall cladding that makes up the outside of this shed. It is redwood comprised 12 mm tongue and groove, shiplap cladding. This clearly looks very appealing and it also has a look that tells potential thieves to not even bother trying to get inside. The cladding is so well designed that there really is no little nooks, slots or any other areas for the rain to get inside. The cladding is very strong, but that is only part of what makes this such a robust structure, you see that along with the 44 mm x 27 mm frame is what makes this one of the most secure sheds on the market right now. This frame is made stronger with rounded edges and really will show no signs of weakness, even 20 or more years from now. Now we are not saying that the people in your street will try to tunnel their way into your shed from underneath, but if they did they would have a very hard time as the floor is made with 12 mm tongue and groove boarding. This floor is going to be able to take the weight of very heavy items. So things like a heavy duty mower or even a safe would be fine in here. Also this type of flooring makes walking in the shed much more appealing as the floor does not have that bouncy feeling that cheaper floors do have. The redwood used to make this shed will be given a free basecoat treatment, but you will still need to treat it yourself after construction and also once a year. 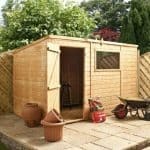 On the off chance that there is some kind of issue with the materials, you will be covered with the one year guarantee that you get with the shed. The door on the 10′ x 6′ Traditional Pent Security Shed is 5 feet 9 high and 2 feet 6 inches wide which we feel is more than enough room to get in and out. Rather than use their standard hinges, which are a good quality in their own right. Treetops Traditional have used some security hinges to make the door close very firmly and also prevent it from sagging. Wow is what we say every time we see these windows on a Treetops Traditional shed. They are very small, but this is to stop people being able to break in through the window. They are made with very robust, horticultural glass and of course they really do look cool. As you can tell by the name, this is a shed that is going to offer you a lot of security. The whole structure is just very sturdy in every way and the door does shut very firmly which we like. Speaking of the door, Treetops Traditional have included a really amazing padlock protector with the shed which you can see in the pictures. 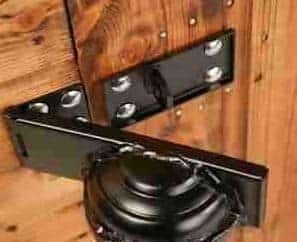 This is something we thought was a great little extra touch that will help with the security of the shed, but for some reason there is no included padlock so you will have to buy that separately. We still find it rather odd how they did not include a padlock with the shed. Even though there are windows on the shed, this is still a very private structure. It is hard to look into those windows so no one walking past your garden is going to be able to have a quick look and see what you have. Unlike their other sheds, Treetops Traditional are not really letting you tinker with the design of the shed in anyway. This is not something that bothers us though as the design of this shed is all about security and they clearly put a lot of effort into the way the shed looks. One way though, you can put your own little touch on the shed can be done when you are treating it. There are many colours of wood treatment out there so maybe look into getting a coloured one to jazz it up a little bit. They do have two extras that you may want to consider. First of all if constructing the shed is something you do not want to do or maybe you do not have the time to do it. Then for £94.99 they have a fantastic installation service. Also to help make the floor even more secure there is a set of wooden floor bearers you can buy for a cost of, £40.99. We really do like how high quality is from the big things like the solid frame to the little extras like those amazing door hinges. Treetops Traditional have built this shed to last and that is something we really like. But as good as the design is and as excellent the materials are, you still will have to treat it once a year. 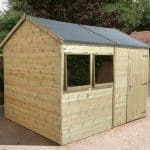 We love the size of this shed and how you have all that depth, but the 6 feet of width makes it so even gardens on the smaller side will be able to handle this shed. Before the shed arrives, you will need to sweet talk a friend into helping you build it. The process as long as you follow the instructions will take you around 4-6 hours. The price may be a little high for some, but the reason for this price tag is because of how high quality and long lasting the materials are. 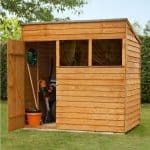 We do feel that this is a shed that is fairly priced for what it offers. Final Thoughts: Apart from the lack of a padlock we really do like everything that the 10' x 6' Traditional Pent Security Shed is offering. The design is something that makes it very different from a traditionally looking shed and that is one of the many things we like about this shed. 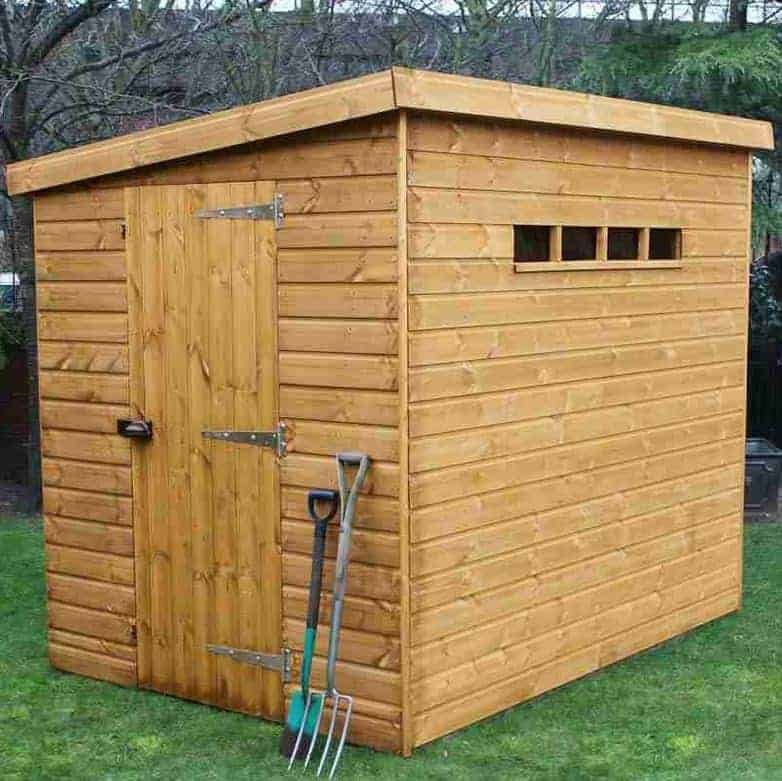 If you need to keep things not just stored, but securely stored because of their value then this is the shed for you. 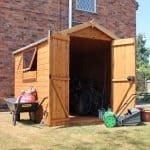 We are very impressed with this shed and if you do want to keep things locked up in a shed that has a very cool look then this is the shed for you.